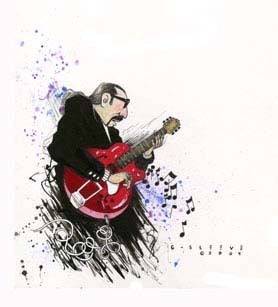 Home > G-sleeve Art > "World of Jazz" Prints by David > "Guitarist"
The "Guitarist" is another print from the World of Jazz Series. This intense musician is deep into keeping time and complementing others in the band, as he plays chords, melodies and improvised solo lines. What makes a great Jazz guitarist? Flamboyance - technique and a dash of magic. Before guitar amplifiers were widely used, it was difficult for jazz guitarists playing acoustic instruments to be heard over drums, piano or horn sections. As a result, jazz guitarists tended to act as accompanists, strumming chords as part of the rhythm section. Once the first guitar amplifiers were developed in the 1930s, electric guitarists were able to project their solo sound over a jazz ensemble. The history of jazz guitar has been an integral part of the wide-ranging history of jazz. The early guitar players were the great blues singers who accompanied themselves on the guitar. By the 1930s, guitarists gained prominence in jazz and some were even featured performers.